CFMA Orange County is pleased to offer members a Sponsor Program to give your organization enhanced exposure to construction industry decision makers in Southern California. This program offers a combination of direct and mass marketing along with many additional benefits. Strengthen your brand while demonstrating your commitment to the industry. 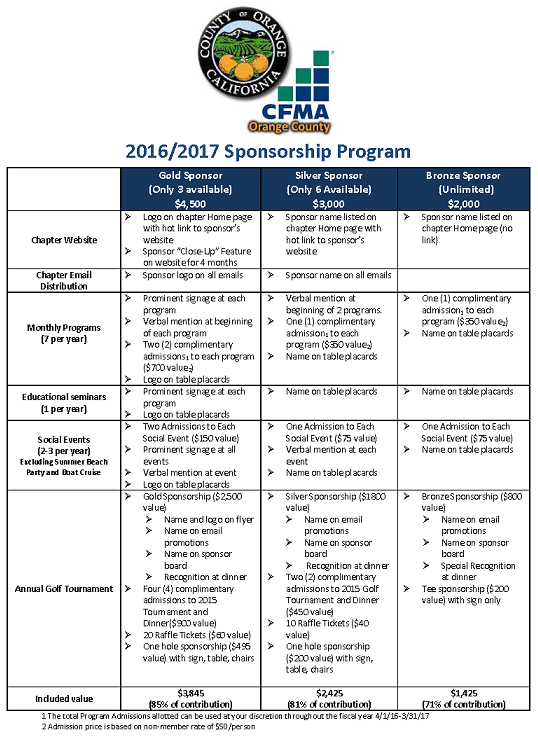 Your sponsorship gives you exposure to the industry while helping CFMA Orange County build superior educational programs and networking events. The 2016-17 Sponsor year begins April 1, 2016 and concludes on March 31, 2017. Sponsors are exposed to both active and prospective members through a variety of marketing outlets. Sponsorship includes a link or company listing on our chapter website to increase your web presence and ranking. CFMA Orange County regularly broadcasts emails to hundreds of important industry decision makers. Sponsors are recognized on our emails. As a sponsor, your firm will maintain Top off Mind positioning with key decision makers. CFMA OC is recognized as the premier organization for construction financial professionals and those serving the construction industry. For questions or assistance, email Steve Spears.